West Sacramento Self Storage at 975 F St. 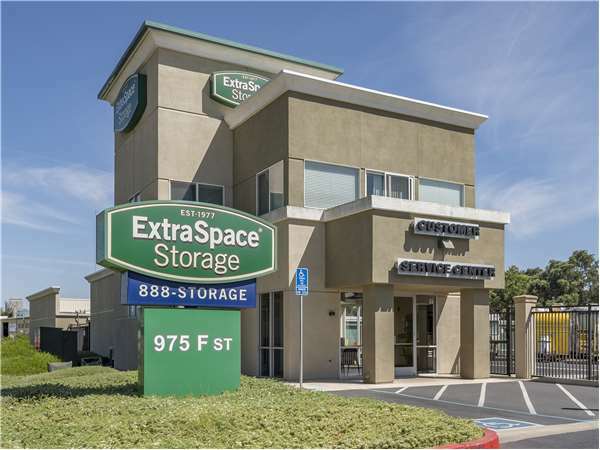 Located at the corner of F St. and Jefferson Blvd., Extra Space Storage serves residents of West Sacramento, Southern Pacific/Richards, Alkali Flat, and Downtown Sacramento. Locals will recognize our facility across the street from West Sacramento Police Department and Prudential Overall Supply a few minutes south of Bryte Church. We're also accessible for residents of nearby apartments, such as Meadowbrook Apartments, Sunset Village, Capitol Place, Rivergate Apartments, and Westwood Vistas. Best place to store your items long or short term. I'm big on customer service, which is pretty hard to find in our society today. Great easy to find location. Staff is very helpful and thorough - but don't expect to get the 1st Month Free...no one does. Someone always available and responsive to requests, inquiries and emergency. Clean storage facility. You can't go wrong choosing this location for yiour valuables and just need a temporary or long term storage. This is the second time I've used ESS. Their climate controlled area for the monthly cost can't be beat. This is the best self storage ever encountered and I recommend it to any one who'se in need. I don't think you the customer will be dissapointed in the cleanleness and professionalism associated with Extra Space Storage. Go take a look from the outside and see for yourself. I love the West Sacramento facility! The staff is very knowledgeable and friendly. I feel so safe going there on my own at night or anytime because I know they have awesome security. I can see the video being recorded and love that I have to log-in and out to turn off and on the alarm on my unit. I love that each unit has an alarm! I feel very assured my items are safely stored and protected. I also love how clean the location is. Every time I'm there, everything is neat and tidy. And there are always flat carts for me to use to unload or load to the car! So awesome I can take multiple boxes at once! The site is perfectly located for me! it's very convenient to the freeway and easy to get to whenever I need to drop something off! Behind Safeway on Jefferson Blvd and across the street from the police station. Near Hwy 50 and Bus 80. North on I-80, Exit Reed Ave make a right, pass Home Depot, Reed Ave will become Sacramento Ave, Right on Jefferson at the 76 gas station, Left on F street facility is on the right across from the Police Department. South on I-80, Exit Reed Ave make left, pass Home Depot, Reed Ave will become Sacramento Ave, right on Jefferson at the 76 gas station, Left on F street, facility will be on the right, across from the Police Department. Downtown Sacramento over the I street Bridge, go down West Capital Ave pass Raley Field, at the fork continue right to Jefferson Blvd., pass safeway over railroad tracks, right on F streeet, facility is on the right. West on 50 towards San Francisco, exit Jefferson make right, pass safeway once you cross railroad tracks make a right on F Strreet. We'll be on the right across from Police Department.